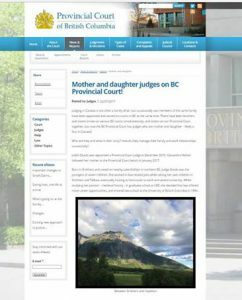 This month, we feature the BC Provincial Court, a Clicklaw contributor. The Annual Report notes that the BC Provincial Court saw 135,663 self-represented appearances in 2015/16. This is a 4% increase, and is the first increase in the past five years. 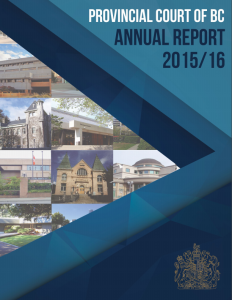 The BC Provincial Court’s 2015/16 Annual Report highlights several of their innovations: the use of video technology to save transports for prisoners’ preliminary court appearances, an active website and social media presence for more open communication, improvement in caseload management, an open and accountable complaint process, and volunteer activities by the Court’s Judges, Judicial Justices and staff. Their efforts to serve the public by providing an accessible, fair, efficient and innovative forum for justice also include several notable initiatives with direct public impact: In addition to hosting the second-ever Twitter Town Hall, the Court is also taking greater efforts to improve meaningful access to justice for self-represented litigants (SRLs), and has recently released Guidelines for Using a Support Person in Provincial Court. The Annual Report noted that the Court saw 135,663 self-represented appearances in 2015/16. This is a 4% increase, and is the first increase in the past five years. A self-represented appearance means an appearance where at least one of the parties does not have (is not represented by) a lawyer. The Guidelines clarify that the Court welcomes self-represented litigants (SRLs) to bring support persons to civil and family court trials or hearings, although individual judges still have the discretion to decide whether the support person’s presence would be disruptive or unfair in a particular case. The help provided by the support person can include: taking notes, organizing documents, making quiet suggestions to the SRL, providing emotional support, and doing any other task approved of by the judge. The Court hopes that this initiative will bring clarity, consistency and credibility. Further details are provided in the Guidelines and the Court’s eNews announcement. 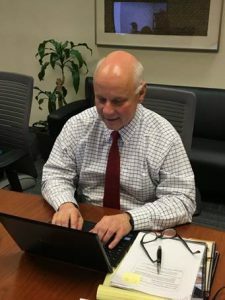 The Provincial Court ran its second ever Twitter Town Hall, which included participants from: justice system organizations, lawyers, students, and people with legal problems. The event invited anyone to “tweet” a question to Chief Judge Crabtree, who would endeavor to answer all questions in a two-hour period on April 6th. The Court received 176 tweets and responded with 129 answers and 9 comments. Recurring themes included: Access to Justice, “unbundled” legal services, the new online Civil Resolution Tribunal and changes to Small Claims Court, diversity on the bench, using plain language, restorative justice, and First Nations Court. The success of #AskChiefJudge inspired the Nova Scotia Courts to launch their own #AskaNSJudge event. The Court also continues to publish new information through its website. As a Clicklaw contributor, the Court ensures its resources are made more widely available and searchable on Clicklaw. Read eNews for useful and interesting information about the Court and its work. New Small Claims Procedures – Starting June 1, 2017, with a few exceptions, civil claims of up to $5000 will no longer be dealt with in Small Claims Court – instead, they will be taken to BC’s new online Civil Resolution Tribunal (CRT). At the same time, the upper limit of civil cases heard in Provincial Court will increase to $35,000. This resource explains which claims the CRT has jurisdiction over, what will happen for: exempted cases, enforcement of CRT orders, and more. You can subscribe to eNews and follow the Court on Twitter.